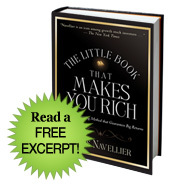 Begin an unforgettable journey to market-beating profits by picking up a copy of The Little Book That Makes You Rich today. Hurry–it's on sale now! [The book] is as clear an intellectual justification for growth investing as you will find. The formula at its heart makes eminent sense." If you had been investing in A-Grade stocks since 1998, you'd have outpaced the S&P 500 10-to-1! Learn how to find A-Grade stocks by examining a specific eight-point fundamental checklist you can begin using instantly. Get too attached to a bad stock and you'll ride it into the ground as you watch your profits melt away. Get too attached to a good stock and you can get too greedy and become over-weighted putting all of your eggs in one basket. Learn the secret to unloading your emotional baggage and knowing when to buy and sell. Mr. Navellier has managed to create a thorough survey of growth investing, one designed for both novices and the experienced...and done it well." What is a Zig-Zag approach? Well, when one sector zigs, another may zag. You want a portfolio that contains stocks that will provide balance to your portfolio. Should one sector slow, the other will accelerate, thus balancing your portfolio and keeping it full steam ahead. One of the Top 10 Investing Books of 2007." In the pages of this Little Book, you'll not only learn Louis Navellier's proven formula for targeting market-beating stocks, but you'll also receive FREE online access to his stock-rating tool that puts his formula to work for you in real-time! With just a click of a button, you'll gain instant access to Navellier's buy/sell/hold recommendations for over 5,000 stocks.